RC Strings recently developed new trebles provide a pure and delicate sound, faithful to the beauty of the voice of the guitar, in a string that provides extreme tuning stability. This makes them especially advantageous for ensemble settings. A “pure” powerful sound with enormous projection and clarity. They provide the maximum expression and comfort for any interpretation. "Have you ever thought that you would prefer to focus on the music rather than getting annoyed by the strings losing their pitch? Or desired a string that has a round sound, perfect pitch and ready to play in one hour? A dream? 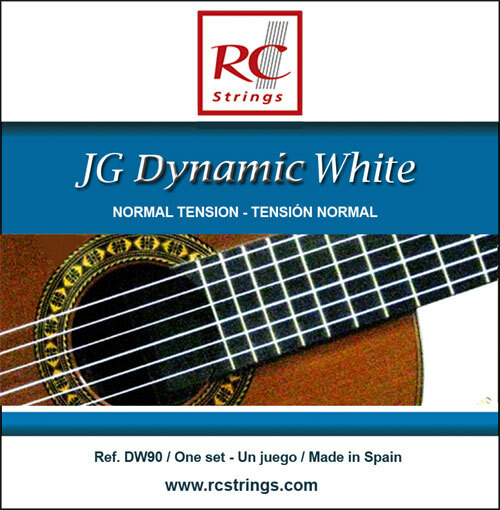 No, The new Dynamic White strings by RC! I used them in my concert with the Berlin Philharmonic and got a perfect result. Thank you RC." Excellent customer service and speedy delivery. Thank you, John. I would like to begin this review by stating that I received a set of these strings for free as part of a Strings By Mail promotion. My first impression was that the treble strings were quite bright, clear and projecting, in a similar manner to carbon strings, but with a less brash/metallic sound. This is how they remained until they became too scratched to sound good (I liked them so much that I left them on the guitar until they were quite dead). The feel of the trebles is most similar to standard clear nylon. Sustain was excellent, intonation was excellent, and they seemed to last at least as well as my go-to set - D'Addario EJ-45's. I have a very dark, warm sound and play a fairly dark sounding guitar, making these slightly brighter strings a good fit for me. The bass strings are another thing entirely. I was not at all impressed with these and quickly changed them out for D'Addario. I found them to be dull, lacking in projection and oddly mismatched tonally. The difference in tone between the fifth and sixth strings made melodies sound discontinuous, and forced me to compensate by playing the sixth string brighter than the other two wound strings. Intonation seemed to be very good, and the lifespan seemed to be average. I am disappointed to see that these trebles are not available for purchase without the basses. I would like to purchase a few sets to try, but will likely not do so if the expenditure must also include expensive bass sets that I will not use. The wonderful trebles get a glowing five stars, and I would give the basses two stars. I put a set of these strings on my Cervantes Crossover 1 and the tone is fantastic. The intonation is perfect. I will definitely be buying more of these strings. I'm a beginner adult student and have these strings on my Alhambra 9P and they feel and sound wonderful. Q: What are the tensions for the strings? It is a pity that some manufacturers have not realized that tension is as important as string gauge, or more so. A: I am sorry we do not have this information at this time. We will be providing all the tensions for every set we sell in the near future. Q: Are DW90 strings nylon or carbon? It's not clear on your description. A: It is a new material, that has tone in between nylon and carbon.